What would you do if someone dangerous asked you to help them find...well... you? Rune Leveau has a magical Talent for Finding things and a mountain of problems. Those problems get worse when she’s approached by a charming, but dangerous, cybernetically-altered, corporate spy. He wants her to help find a wanted criminal named Anna Masterson, who went missing six years ago. That should be easy for a woman who's special gift is finding things, right? But Rune has a dangerous secret. She IS Anna Masterson. Over the past six years, St. Benedict has searched for the Masterson Files, a computer program rumored to do the impossible—cast magic spells. The technology could reshape the world. For his own reasons, he's determined to find it and the mysterious woman connected to it, Anna Masterson, before anyone else. Having exhausted his other options, he’s left with a new hope that this Finder of the Lucky Devil can lead him to the prize he has sought for so long. But the Finder is proving difficult, and St. Benedict isn't going to take no for an answer. 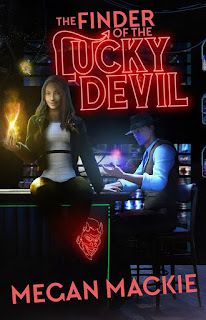 Set in an alternate Chicago, where technology and magic are in competition with each other, this fast paced Cat-and-Mouse chase makes The Finder of the Lucky Devil a welcome addition to your urban fantasy/cyberpunk library. 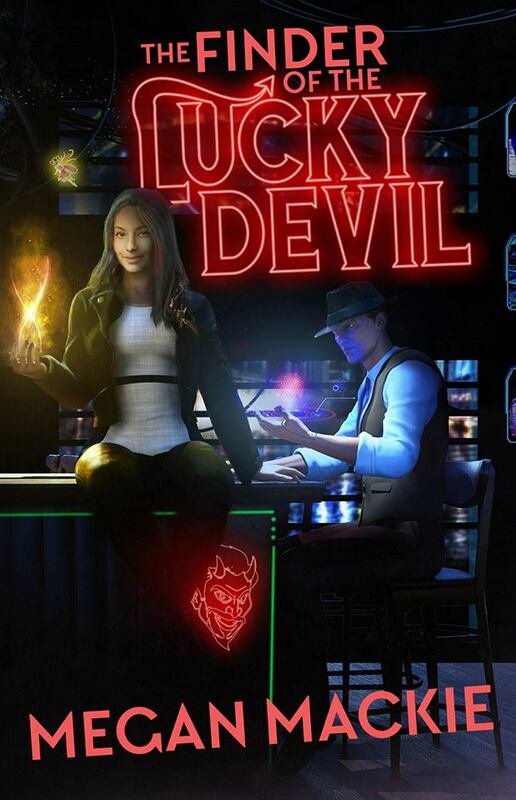 The Lucky Devil is a very cool bar and restaurant in a fantasy version of Chicago. Owner Rune Leveau is The Finder, a human with one simple magical Talent: she can find just about anything. People drop into The Lucky Devil to make wishes and ask favors, seeking her help. Rune only recently inherited the bar, and she's having trouble making the mortgage payment on time, so she's pretty much open to taking any Finder job people request, until a corporate agent named St. Benedict walks in. He's mostly human, with some technological "upgrades" that help him perform his spy-like duties more effectively. He needs Rune's help finding one person, and he's offering a large payment. There's one problem, one reason Rune turns down the job: the person he's looking for is someone she's spent years hiding from the government. St. Benedict is nothing if not resourceful, and through a crazy set of circumstances, Rune finds herself seeking his help in no time. The adventurous next few days takes them through a maze of the mysterious and fantastical underbelly of Chicago that tests their skills, their loyalties, and their conviction. This is a fun read with some heart stopping moments. I did not accurately predict how it would end, and Mackie so artfully dropped the bottom out of my heart then splashed me with a satisfying thrill of hope. If you're looking for a fresh urban detective-style fantasy with wizards, fairies, corporate spies, shapeshifters, and even a mermaid dog stylist, don't pass this one up. It might be just the thing you need to find. It's here on Amazon and here on Goodreads.